Continuing from Reasons, 3 . . . This post owes almost all of its details to T. E. Schmidt’s Jesus’ Triumphal March to Crucifixion. So if you’ve read that there is no need to read this. I have a few additional points here, but nothing substantial. I only attempt a slightly different perspective, that’s all. Firstly, I am going to try to avoid using the word “irony” in connection with Mark’s narrative here, since I have recently been alerted to the fact that the literary use of irony is a relative latecomer in the history of literature, and that what authors of Mark’s era were taught and practiced was the good old Aristotelian gradually unfolding “recognition” scenes. These were the stuff of ancient Hellenistic creative literature. Christ always leads us in triumphal procession, and through us spreads in every place the fragrance that comes from knowing him. For we are the aroma of Christ to God among those who are being saved and among those who are perishing. The Triumphators’ followers were saved, and some of his prisoners were sent off for execution. The conquering general or emperor was hailed as the epiphany of God. Initially he was the god Dionysus, but later was identified with Zeus. The crowds who came to see this event would repeatedly cry out “Triumpe”, a call for the god to make himself manifest. The soldiers call for the whole cohort of 200 men minimum. It is unimaginable to think of 200 soldiers being called out to make fun of one man. It appears that Mark is signalling to his readers that Jesus about to embark of a triumphal procession as a sign of his power over all his enemies, and he is doing this by bringing in the props that were used for a Roman emperor’s procession. The Roman emperor wore purple. It was a colour forbidden to lower ranks. Schmidt remarks that in Jerusalem the only purple cloak available for this mockery of Christ would have been Pilate’s, and Pilate is hardly likely to have lent his out for this occasion to be spat on. Mark instead is signalling to his readers in the know that Jesus is the true imperial conqueror, in particular at this very moment. The Roman triumphator would be clothed in purple, wear a crown of laurel, and hold a staff in his right hand. Another anomaly here is the notion that there would be right nearby a handy clutch of thorn branches for soldiers to make an impromptu crown. The details are signalling to the reader that this moment of humiliation is in fact the moment of Jesus’ Triumph over his enemies. Before embarking on the triumphal procession the Roman conqueror would stand before his soldiers to receive their adulation. Again, this is the author’s way of adding more detail to verify the truly conquering identity of Jesus, though this is obviously hidden from the actors in the narrative. And when they mocked him . . . This point is not discussed by Schmidt, but I think it is a significant detail nonetheless. Roman triumphators, even though appearing as a god, would be accompanied in by those whose task it was to mock, ridicule and insult them in their ears — in order to remind them, we are informed, that they were but men. To keep them humble. The triumphal procession included the sacrificial animal being led by its executioners carrying the double-bladed axe, the instrument of their execution. Not mentioned by Schmidt, and a detail that is testified (in a historical novel by Heliodorius) a good century after this narrative was written, is that these butchers or executioners of the triumphal sacrifice were taken from the countryside. That was their “craft”, after all — butchering their animals for sale. Again not mentioned by Schmidt, but I can’t help but wonder about the names Alexander and Rufus in this context. Who was Alexander but the archetypical Greek conqueror, and who is Rufus (meaning Red) but the Roman conqueror in such a procession whose face was painted red in imitation of Zeus for this march. And Simon a Cyrenian, is, of course, the namesake of the Simon who failed Jesus at this moment. Instead of taking up his own cross and following Jesus, he is assisting with the execution of Jesus. And they brought him to the place Golgotha, which is translated, Place of the Skull/Head. “Romans, tell your fellow citizens it is ordered by fate that the place in which you found the head shall be the head of all Italy,” (and) since that time the place is called the Capitoline hill from the head that was found there; for the Romans call heads capita. The temple of Jupiter Capitolinus, or more simply the Capitolium, was the terminus of every Roman triumph. The procession would wind through the streets to the Forum, culminating in the ascent of the triumphator to the place of sacrifice—the place named after a death’s-head. The name “Golgotha” (head) may simply be a linguistic and historical coincidence, but to an audience prepared by the context of Mark’s gospel to look for double meanings, it would be a glaring and meaningful coincidence: Golgotha was the Capitolium (head) to which the triumphator ascended. I used to disagree with Michael Turton’s suggestion that Mark’s gospel was indicating that Jesus was crucified in or at the Temple. I am not so sure I should disagree any longer. If Mark was writing for a Roman audience, and this is often suggested by scholars, then he gives no reason to think that his readers would picture any scene other than Jesus being crucified at the Jerusalem temple. It is worth recalling that some early Christian texts (e.g. the last part of the Ascension of Isaiah and the Book of Revelation) did indeed say that Jesus was crucified in Jerusalem. Then they gave him wine mingled with myrrh to drink, but he did not take it. And when they crucified him. . . Expensive wine is offered at the moment he is to be sacrificed, but he does not take it. Roman readers familiar with the Roman triumphal procession knew that at the moment of the sacrifice of the bull the emperor was offered wine, which he poured out on the bull itself. The bull was the god dying and the emperor was the god living at this moment of the pouring out of the wine. And with him they crucified two bandits, one on his right and the other on his left. It ought to be obvious that the original author was not interested in narrating history. Historical reconstruction is not on his agenda. The whole structure is composed of implausibilities and oddities (the fact of the crucifixion itself with Pilate releasing a rebel and crucifying Jesus just to please a crowd, the crown of thorns, cloak of purple, 200 soldiers called out for one man, offering a very expensive wine — not a pain killer — with myrrh; and more is to follow, with noon turning to dark, etc.) that serve to inform insider readers that Jesus was, at this moment of humiliation, undertaking his conquering procession. And this, note, is the first narrative of the crucifixion after Paul’s many references to it as a theological (only) event. Posted on 2009-07-03 05:53:50 GMT+0000 by Neil Godfrey. 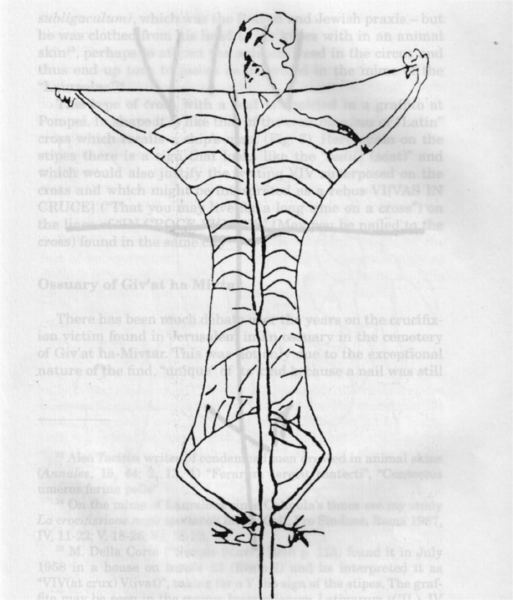 This entry was posted in Biblical Studies and tagged Crucifixion of Jesus, Gospel of Mark. Bookmark the permalink. According to http://ezinearticles.com/?Purple-Anyone?&id=2428410 purple dye was worth its weight in silver. Just the sort of thing people would spit on and waste on a person to be crucified….. Along with that expensively scented (with myrrh) wine — something at least one wise man from the east thought worthy of being a gift for a newborn king. And the Romans considered myrrh to be a sexual aphrodisiac. It has no business being at a crucifixion! Even though the Romans attached an impaling stake to each cross, which was, of course, the ultimate humiliation of the condemned criminal. I apologise for the tardiness of the comment, I just found the blog article.